Also, Piano Sonatas Nos. 3 and 12. 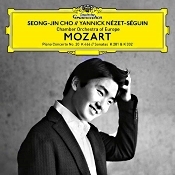 Seong-Jin Cho, piano; Yannick Nezet-Seguin, Chamber Orchestra of Europe. DG 00289 483 5522. The month of this post, December 2018, marks the 120th anniversary of the founding of the German record label Deutsche Grammophon, making it the oldest continuously operating record company in the world. In an era of ever-changing musical formats (vinyl, 8-track, cassette, CD, SACD, Blu-ray, downloads of every stripe), it's good to see a giant of the industry surviving and, presumably, thriving. Most of the time with Mozart's piano concertos, record companies couple two such concertos together on the same disc. This time out, either the company or the artist decided to combine one piano concerto with two of the composer's piano sonatas. The artist, Seong-Jin Cho, says he wanted a contrast in the accompanying pieces, which he certainly got. Seong-Jin Cho is a young (b. 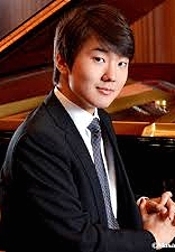 1994) South Korean pianist, who rose to international fame following his first-place finish in the 2015 International Chopin Piano Competition. He has since performed with major orchestras all over the world, participated in festivals everywhere, and recorded now five albums for DG. He is an accomplished musician and certainly a crowd favorite. The program opens with Mozart's Piano Concerto No. 20 in D minor, K466, one of the composer's most-popular offerings. A lot of folks may remember it from Milos Forman's 1984 movie Amadeus, where the Romance appeared in the closing credits. Mozart wrote the concerto in 1785, a half dozen years before his death, and as he only wrote twenty-seven of them (only? ), it was also among his last. Anyway, Cho tells us he likes playing Mozart so much because the music is so filled with joy, emotion, and operatic drama. Needless to say, these are the characteristics Cho emphasizes. The first movement Allegro begins a bit solemnly and theatrically, rather in the vein of Don Giovanni, brightens up a bit, and then ends quietly. Although the piano takes its time about entering, it is a welcome entrance as it brings a fair measure of joy. Cho displays a handsome bravura here, and one can understand why he so enjoys the music. The Chamber Orchestra of Europe under the direction of Yannick Nezet-Seguin follows along obediently, if somewhat mechanically. The second movement Romance is among the most sublime creations in all classical music. It begins in a mood of exalted peacefulness, although we hear a somewhat turbulent and contrasting middle section before the music returns to a tranquil conclusion. The Oxford Dictionary of Music defines "romance" as generally implying "a specially personal or tender quality." Cho doesn't so much convey that "tender quality" as he does carry over the joy conveyed in the first movement. Personally, I could have done with more a heartfelt or even more softhearted interpretation. While Cho's rendering of the music seems too matter-of-fact to me, a lot of listeners will no doubt be more touched by it than I was and find his direct, well-controlled approach most appealing. The final movement Allegro assai (very fast) is restless yet still cheerful and generally sunny. It appears to fit Cho's manner of skillful, energetic playing quite well and brings the work to a satisfying close. The two sonatas couldn't be more different from one another, No. 3 youthful and exuberant yet highly virtuosic, No. 12 more diverse and even more demanding. As before, Cho displays an exacting technique that manifestly demonstrates his technical process. Producer Sid McLauchlan and engineer Rainer Maillard recorded the music at the Festspielhaus, Baden-Baden, Germany (concerto) and Friedrich-Ebert-Halle, Hamburg-Harburg, Germany (sonatas) in June and July 2018. The orchestral sound is clear, dynamic, and ultra clean. It's also a tad close and dry, with not a lot of depth (kind of one-dimensional). The piano is also a touch close, yet, as always with DG, sounds quite realistic, both in the concerto and in the sonatas.